The time has come for this month’s event: Caress of Steel! The Forsaken have continued their push towards The Lost Continent. Greta Spader and Isurus have formed an alliance between the Draconians and The Scourge. There are whispers that there may be more beneath the surface to their alliance. The combined power of The Fangtooth fleets and the Hunter Mk.1 fleets may be too much for the Forsaken to overcome. Event runs from Thursday, October 12th @ 9am PDT to Monday, October 16th @ 9am PDT. These features will become disabled at the start of the event for their respective worlds. For example, at 9am PST, relocation will be turned off in World Alpha but will be available for all other worlds. However, you cannot relocate to World Alpha once relocation has been turned off for that sector. Caress of Steel is the first event in the Sacrifice and Decay event cycle. Targets include Scourge Blockades that include Scourge Sentry Ships, Daggertooths, Electric Eels, and Goblin Sharks. These are tuned for Fangtooth and Hunter Mk.1 fleets. Scourge Blockade are classified by Tier (Tier 5; Tier 4; etc). 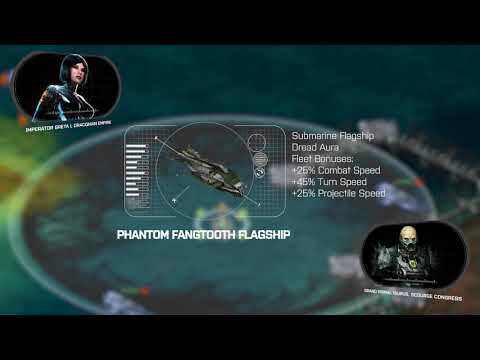 For Fangtooth Depth you will be able to bring a Tier 0.x (any 0.something) or Tier 1.x (any tier 1.something) hull as a flag ship. Such as a gunboat. Each target is worth a maximum number of points, as noted below. Completing a set will award a completion bonuses. Continuous target completions will count towards future set completions. Hitting targets that are below your recommended level will result in fewer points. This does not affect the completion bonus for a finishing a set. A level 99 target that begins spawning on Saturday will also have a Uranium payout (~42k) upon completion. This target is not worth any event points but may be completed for a Uranium payout. This target will begin spawning on Saturday at noon and continue to regularly spawn hourly throughout the rest of the event. These targets will spawn near Nav Relay towers. You will need to redeem either Torpedo Tubes or the PBX Payloard to open the Locked Store. If you already own both Torpedo Tubes and the PBX Payload you will have access to the Locked Store already. The cap for the number of Courages owned is being increased from 2 to 5 with the event. There has been some confusion on the tier 7 targets. While they list 2,000,000 points for the reward that is for destroying ships in the target. There is also a 2,000,000 reward for completing the target. For a total of 4,000,000 point if complete either Hunter's Bay or Fangtooth Depths. If you complete both targets there is also a 4,000,000 point bonus for the set. We had a few items at the wrong price in the event store. They were listed at 5,000,000 points instead of 4,000,000. This has now been corrected. If you have been effected by this you can submit a ticket to support and they will be able help you get your points credited.